Want to install those MBP collets? The test bike is a 2000 Ducati Monster ie. 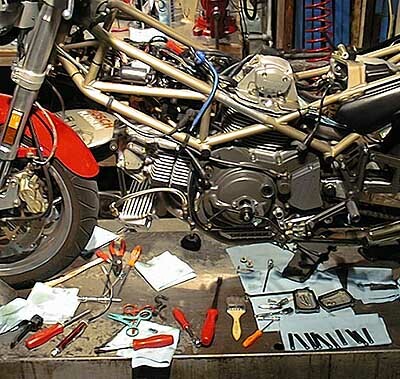 The first thing to do is strip the bike down for a valve adjustment. On the Y2K Monster, I pulled off the tank and airbox to ease access. Now is the time to make all of your clearance measurements. 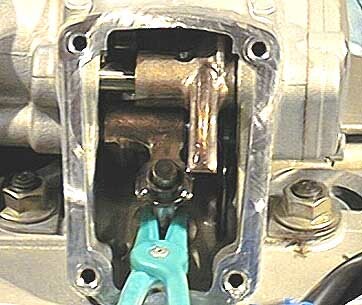 I then remove the belts and rotate the crankshaft such that whatever cylinder I'm working on has the piston at TDC. 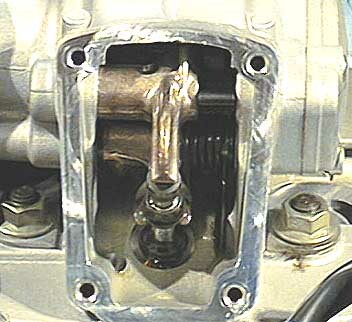 Step 1 You pull the valve cover(s). Click on the image and look at the blow up... 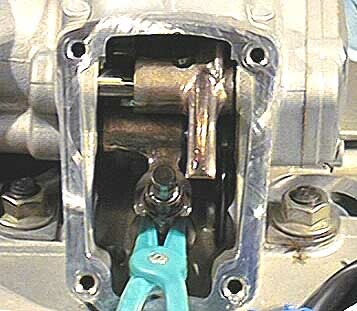 There's a clip to the side of the opening rocker arm. Rotate the fold of the clip so that it is sticking out. Step 2 I use a Snap-On cotter pin puller to fit in the edge and pry the clip off. A cotter pin puller looks like a bent ice pick. Step 3 With the clip missing, you can slide the opening rocker arm to the side. 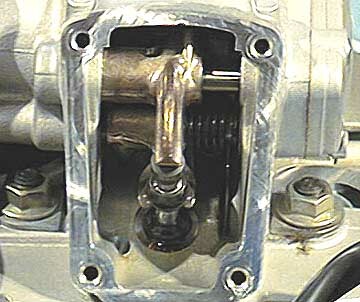 Note that you may need to turn the camshaft to allow the rocker arm to move over. Pull off the opening shim and record its size. I have a plastic compartment box with 4 compartments devoted to the parts I pull out of the motor: Front intake (Fi), Fx, Ri, Rx. Step 4 I use plastic forceps to hold the valve during subsequent operations. The piston is at TDC, so we don't worry about the valve falling into the cylinder, but we do need the valve to stay up and in place. In this view, you can notice the OEM collets. Unfortuantely, I learned recently that the ST2 isn't compatible with my plastic forceps. You all are suckin. Step 5 Press down on the closing rocker arm to expose the half rings and remove them with a magnet. 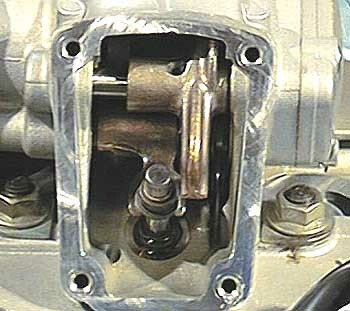 Note that you may need to rotate the cam to find the "trough" for the closing rocker - which allows it to travel. Step 6 This may seem really easy... lift the closing shim off the valve. 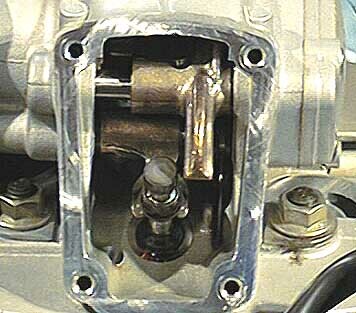 Newer 2V Ducatis (1998 and up) seem to have a small groove cut near the top of the valve. The closing shim gets a littel bit beat up with the stock collets and gets mushroomed. So? Well, this mushrommed lip interferes with the line/groove near the top of the valve. And you get to spend some time sanding that groove down to allow the closing shim to come off. Update: MBP Ducati has updated the design of the collets to incorporate a radius along the outer edge. This radius reduces the "mbp collet delta" down to jsut .003" !! Since this is often how much the closing shim is loose anyway, it's often a perfect fit. Also, this new design is compatible with all Ducati OEM closing shims.